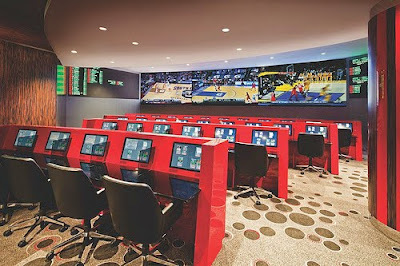 Just in time for March Madness, Cosmopolitan has opened a sportsbook. Cosmo has partnered with Cantor Gaming to open the book on the second floor of the hotel next to Holstein's restaurant and Marquee Nightclub. The sportsbook is small by Strip standards, but with Cantor's mobile gaming devices customers won't need to actually be at the sportsbook to place wagers. Cantor has some interesting new concepts for sports betting, including live betting throughout the game. They just opened a new book at Tropicana, and also have locations at M Resort, Venetian and Palazzo. When Cosmopolitan opened in December it did not have a "traditional" sportsbook. Instead the Book & Stage lounge served as a place where you could place wagers. The betting terminals at Book & Stage will remain open. I know Cosmo caught some flack for not having a real sportsbook. I wonder if this is a direct response to that, or if it was planned all along. It seems like sports weekends are a huge part of Las Vegas with the Super Bowl and March Madness. Having a legit sportsbook would almost seem like a requirement for any casino resort. For more information, see the Press Release and Cantor Gaming.